Would the three Bernices eat? That was the most critical question. 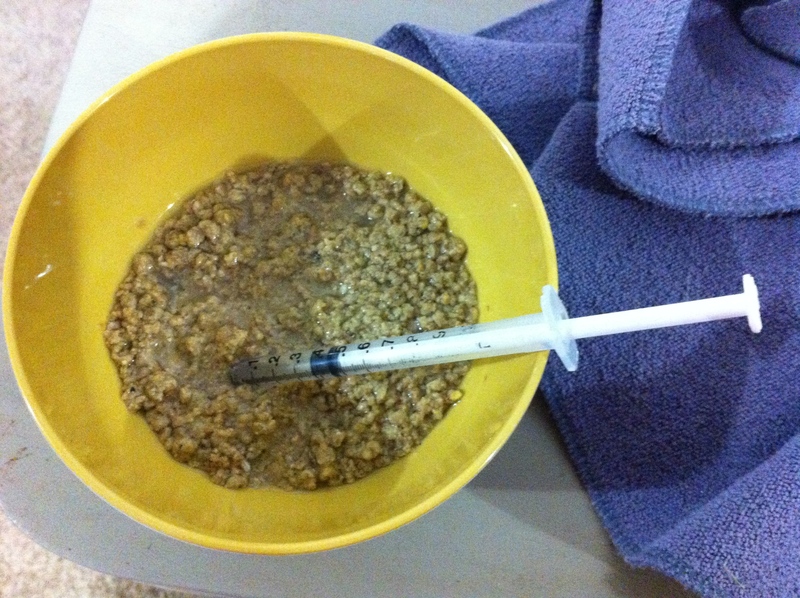 Not having immediate turkey feed available, we used chick feed granules, soaked in water. They were not interested in the least. At 3:00 a.m., my daughter, Roni, woke me up concerned that they hadn’t eaten or drank…time for a little forced nutrition. Using a syringe, no needle, we worked together getting a soupy mixture into their mouths….waited for them to swallow, and added more. The next day, I stopped at the feed store and picked up flock raiser feed for turkeys. Not completely soupy yet…but you get the picture. The littlest poult, the first one we found after mama turkey had returned, was still quiet, but swallowed the food as the others. This little Bernice seemed to need a little extra attention, and was very happy to snuggle under a towel in Roni’s arms. The other two Bernices were less receptive to cuddle time, and were huge wiggle worms. Littlest poult Bernice. Believe it or not, she is fast asleep here…she loved to cuddle in Roni’s hands. One of the other Bernices…fat and sassy! Every 2 – 3 hours we went through this feeding routine, taking shifts to support our differing schedules. 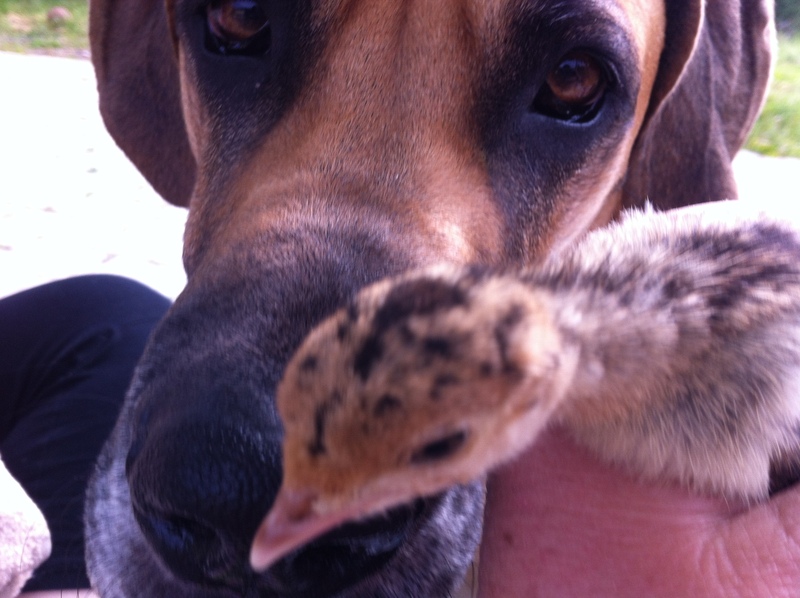 Roni liked to take the poults outside to feed them. They seemed to perk up when taken outside. One of the three has a wing (or wing feathers) that sticks out away from its body. 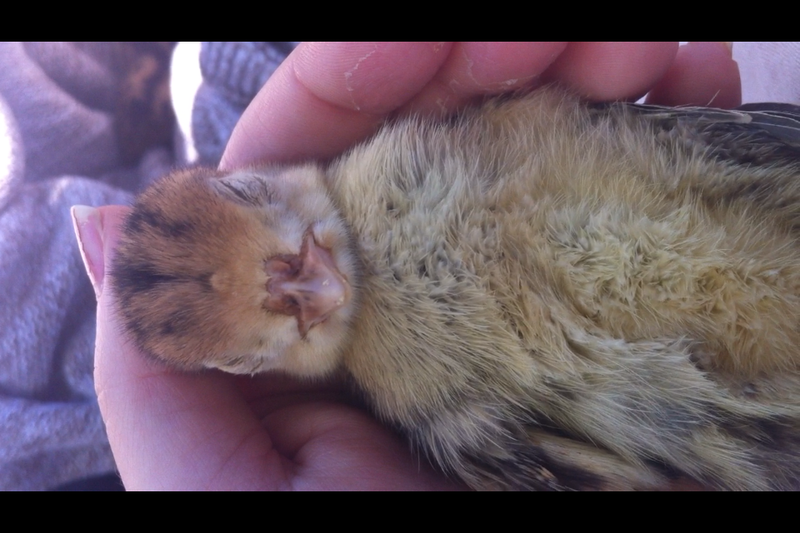 This may be the little one that Penni picked up by its wing when she originally found them. Hopefully, it is just a feather, cosmetic issue…it seems like it. On the second night, Roni again woke me up afraid that the littlest Bernice was dying…it looked like she was. 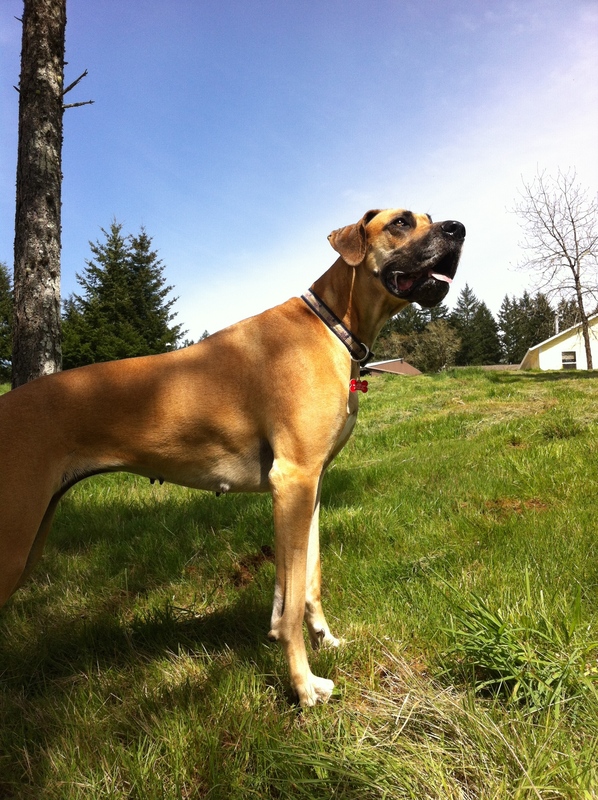 Her head was floppy, and she had no significant strength to her legs. I thought about my little rooster, Austin Healey, and how sugar water helped him to bounce back and ignite his appetite…it was worth a shot. The littlest Bernice readily swallowed the sugar water from the syringe…and we waited. A couple of hours later we fed her turkey feed softened with the sugar water. By morning, she was much stronger! She looked like she had turned the corner…one more meal, and I went off to work…by noon time, the littlest Bernice had died. 😦 It was very sad. She just never was as strong as the other two. Still sleeping…her tummy was full, she was warm and safe. Notice the food crumbles on her beak. The other two Bernices gained in strength, and within a day of each other started eating and drinking on their own…YAY!! They are definitely wild birds, and do not look forward to human interaction…this is great news for their eventual release. We’ve had a couple of escapes…twice outside, once in the garage…and they immediately run and burrow under whatever they can find..it’s not easy to retrieve them. One’s a blur, the other showing off her long neck and legs. Notice that wing, it should be tucked tight against her body. Within this first week, their legs are longer, and their necks are stretching. 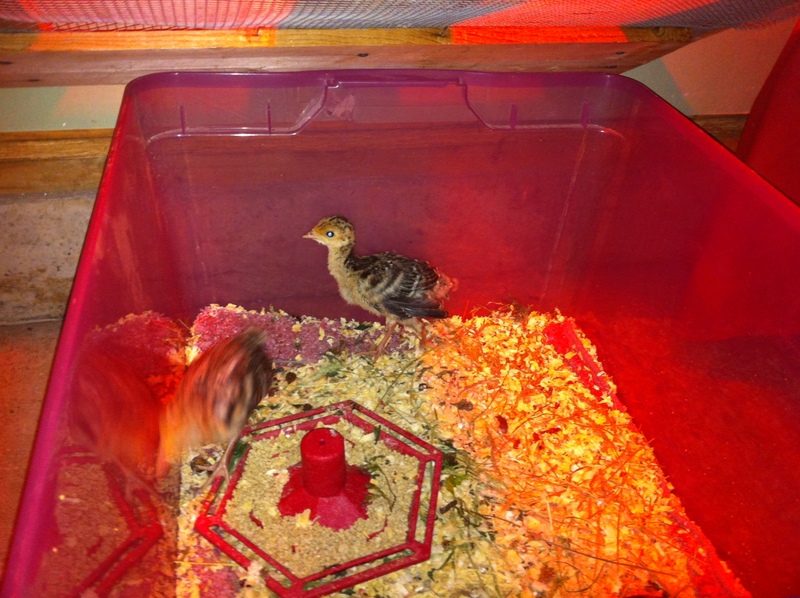 They are able to jump out of their brooder if the top is off, so feeding has become a bit of a challenge….but, today…they have graduated to eating turkey feed granules…no more soaking!!! It’s a new, fun challenge…like many we are experiencing out here in the forest and on the farm….but wait, there is more…. Can’t wait to tell you of the early, morning wake-up we had a couple of days ago, opening up a new chapter to this year’s spring – summer management on the farm. Never a dull moment!! 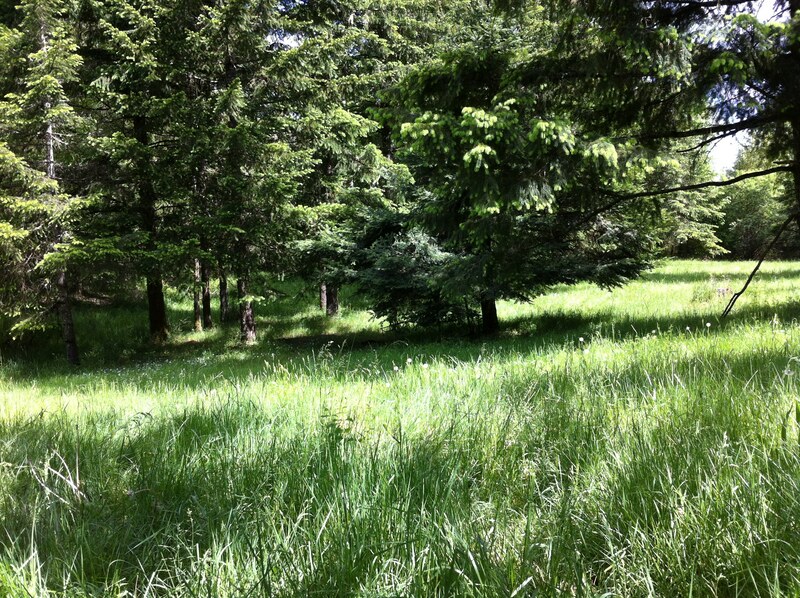 Hope you all have a wonderful day….see you tomorrow as we walk through the forest. The hardest thing to do was to walk away, but walk away we did…completely away….for about 45 minutes. Leaving the dogs in the house, I quietly walked out to check on the little wild family, hoping to find their absence. All was silent except the sound of the wind through the trees. Here is the actual reunion…listen closely, you can hear some peeping, and at about :17 – :21 you can hear a faint call from mama turkey. The sounds in the background (besides the wind) are our neighbor’s Guinnea Hens. Crouching down to make my profile as low as possible, I watched. There was absolutely no sign of mama turkey. Watching for movement within the grass was really a wasted effort as the wind kept the grass in constant flux. As I slowly approached the area where we had set the poults on their journey back to their matriarch, sadness bestowed my eyes. 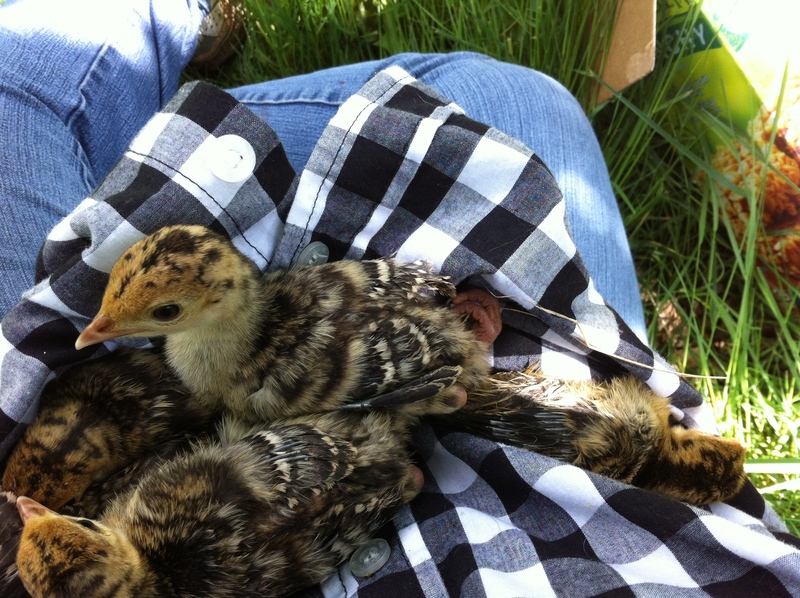 There lying in the grass was a little poult, right where we had set it free…it hadn’t followed mama turkey’s call. I wasn’t sure what to do…leave it in the grass or pick it up? My protective instinct won over, and I picked it up. It didn’t protest, and burrowed into the warmth of the pocket I had created within my shirt. This little one was tiny. 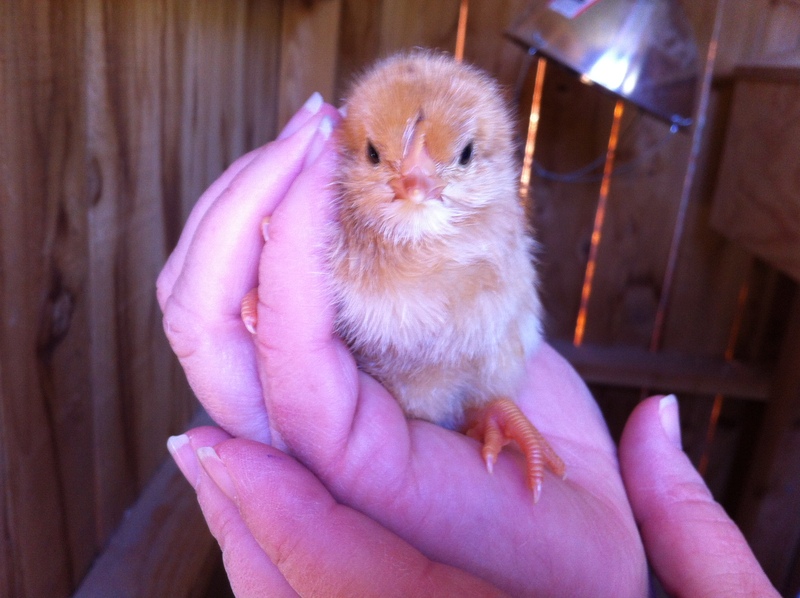 Feeling that she needed to be warmed up, I quickly set up a small brooder with a heat lamp to warm her up. Bernice, the young little poult warming up in under the heat lamp. About 2 hours later, around 7:30 p.m. I decided to take one more look and listen. We had a little over an hour left of light, if more babies missed the call, I wanted to find them. As I stopped and listened, my heart sunk as I heard a familiar peeping. 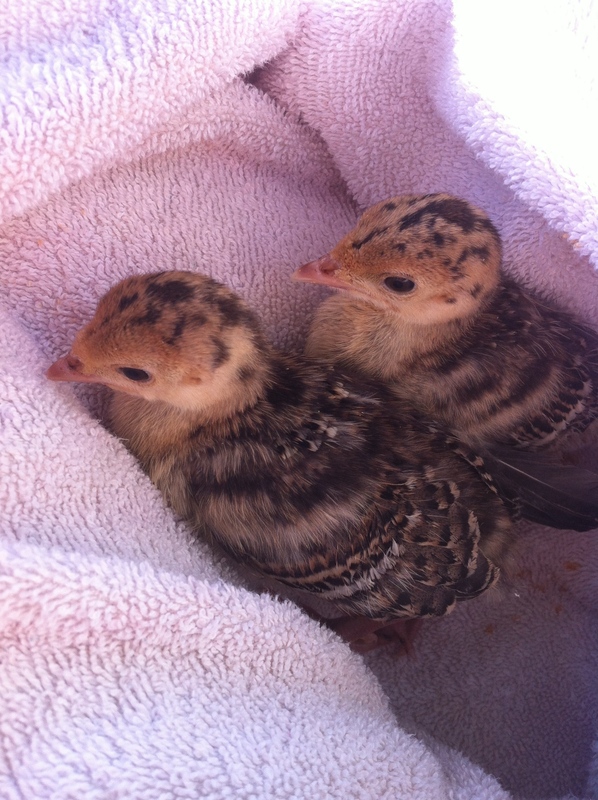 Peep, peep, peep…three in succession…peep, peep, peep….it was calling for mama turkey. What I heard in return was not the adult’s call, but a return peep, peep, peep from a different direction. They were trying to find each other. It was getting cold, they needed each other for warmth…I decided it was time to help them…I didn’t believe they would make it through the night with snakes, racoons, skunks, owls, and who knows what else, out on the hunt as nighttime fell. I tried following the peeoping…but everytime I made a move in that direction, it would stop…and then I would hear the other call leading me in another direction. I stopped and watched the grasses for any sign of movement different from the rhythmic dance caused by the wind. 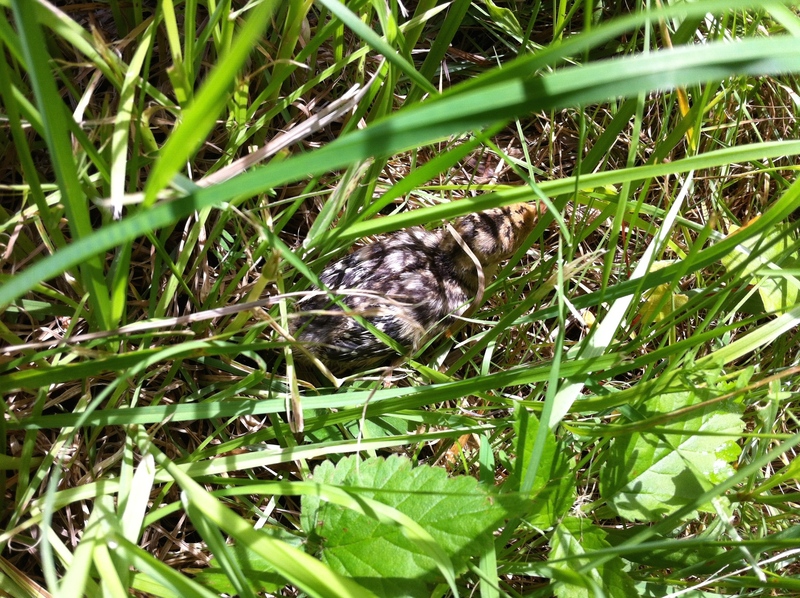 All of a sudden I saw a tiny poult head pop up out of the grass, stumbling unevenly. 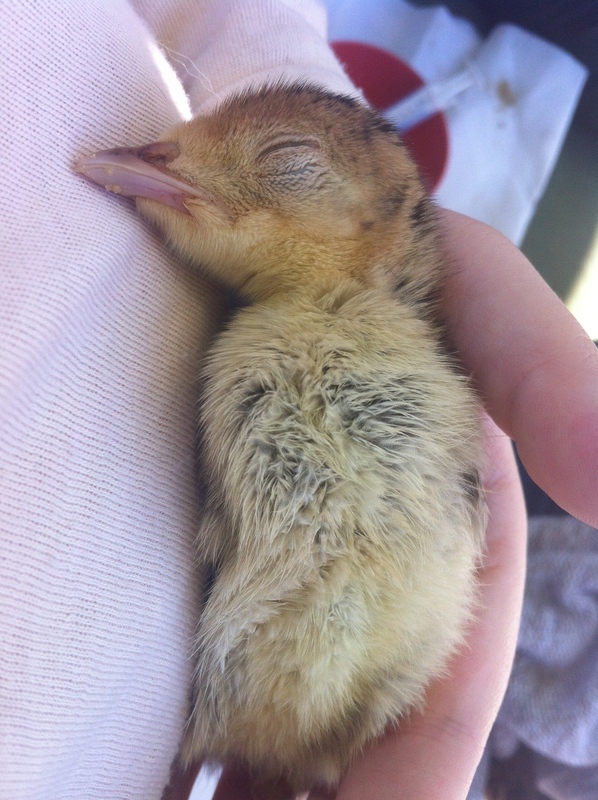 I quickly swooped in and gathered the little poult up out of the grass. The I listened….the seconded source of calling was coming from behind me. Staying still, the third little poult showed itself in the same stumbling-about manner. The two siblings were reunited. Another 20 minutes of quietly watching and listening resulted in no sign of additional little turkeys. 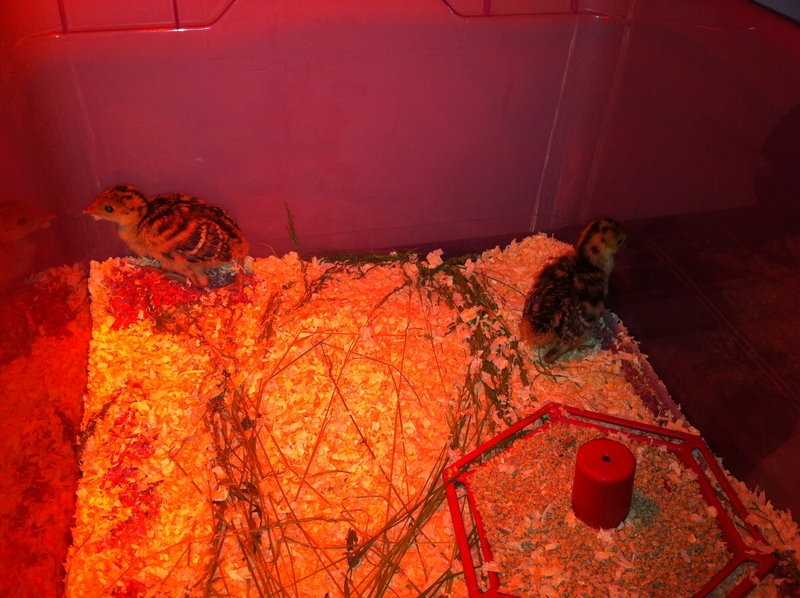 Walking back to the house to add these two little ones to the brooder, I worried that there were more orphaned poults. I went back two more times that evening and found no signs of additional babies. My attention now needed to be turned to helping the three in the brooder grow to the point of being released back into the wild. My daughter decided that little project belonged to her, and named them all Bernice. And two more make three. Bernice, and Bernice. 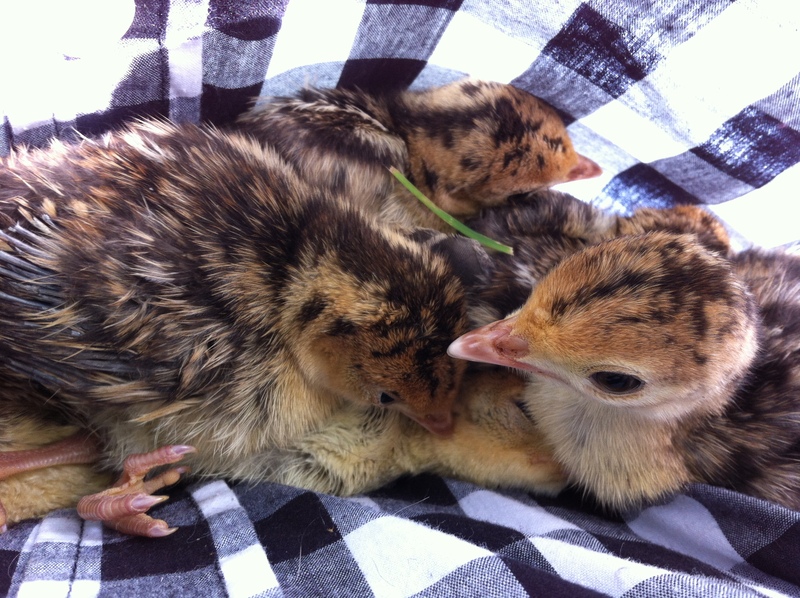 To be Continued….tomorrow…find out about the challenges of supporting three wild turkey poults. Hope you have a wonderful Memorial Day…thank you to all those current and past who have protected our great United States with their many, many sacrifices in military duty. My family and I are forever thankful and grateful for you! May God richly bless you, and your families! 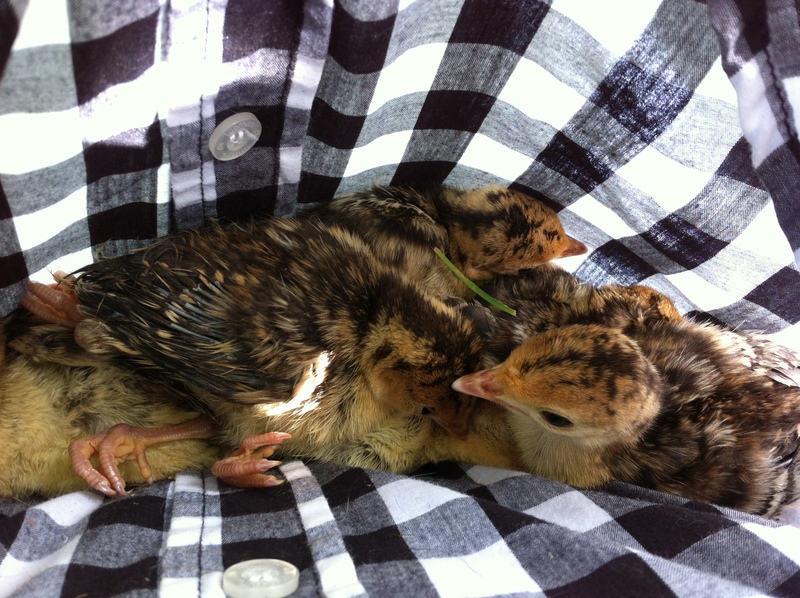 The poults burrowed into their hiding place, nestled within our clothing. They totally came alive, however, whenever the possibility of freedom enter into their sites. This was a great thing! Their quietness was instinctual, their flight response was crucial to their survival once released. One of the poults jumped from my grasp into the tall grass. Even though I kept my eye on where it landed and the direction it headed, almost instantly it vanished…completely disappeared. A hidden poult! With her head slightly raised, this one was actually a little easier to see. 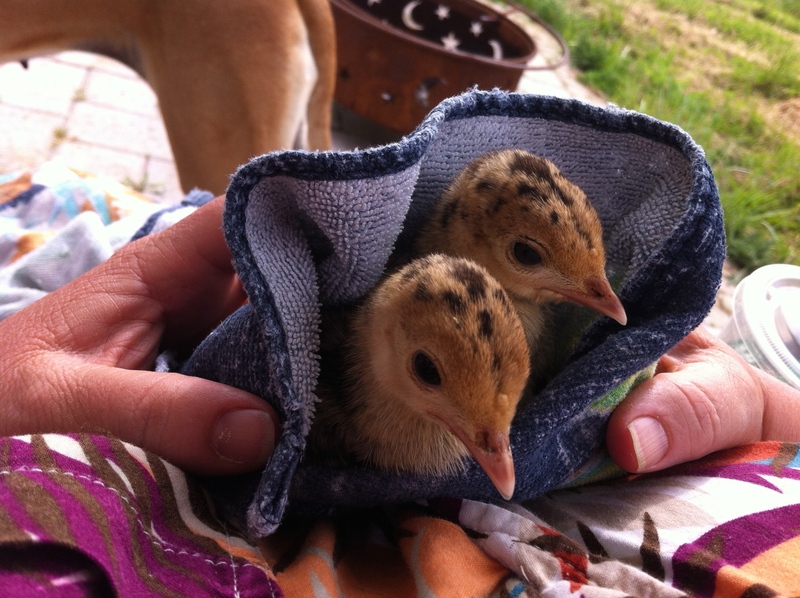 Very carefully I searched…only me, we didn’t need two sets of feet potentially stepping on the invisible young turkey. All of a sudden, there it was! I scooped it up, hoping that mama turkey would soon return. My daughter and I sat quietly, looking for any movement through the grass, which was a bit of a challenge since it was a windy day. All of a sudden, off to the right at about 200 ft. was the beautiful, bobbing head that we had been looking for. she called…our little ones woke up. We let them go, hoping they would find their way to her. This was a difficult. What if they didn’t find her, would we be able to find them again?? We wanted to walk up to mama turkey and say, “Here they are,” but we knew that wouldn’t be possible…she would leave again…would she then come back? We just had to let the poults go and hope for the best. Getting close to release time, mama turkey is calling. the young poults chirped as they moved through the grass. We watched from a distance, but it was hard to tell when a poult would reach her. Not wanting to affect the reunion we carefully, and quietly backed off. Nature was now leading the reunion……. (To be continued)…the story gets bigger…come on back for tomorrow’s chapter! 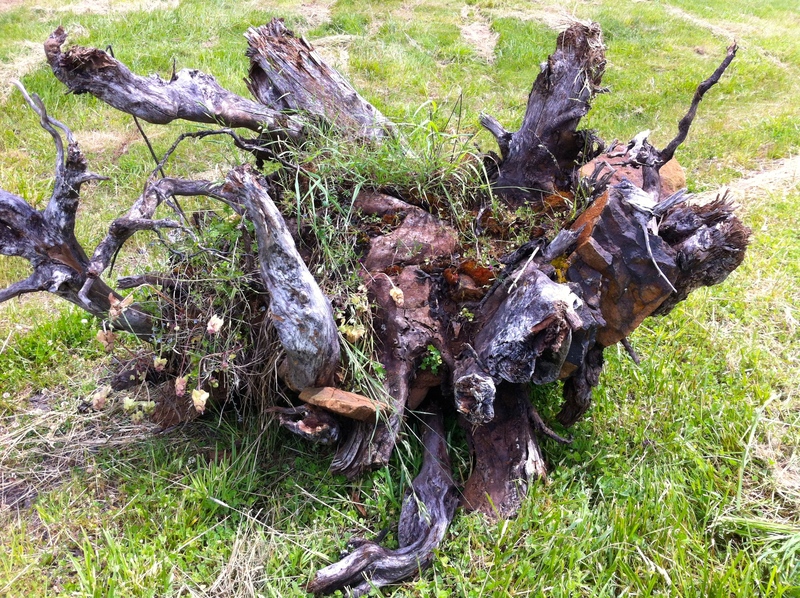 The underside of a felled Douglas Fir tree. ….so did Penni, just fractions of a second before I did..but that was enough time for her brain to excite her body into “chase mode” and off she went. Mama turkey immediately took flight. I looked around the area, checking carefully before each step. 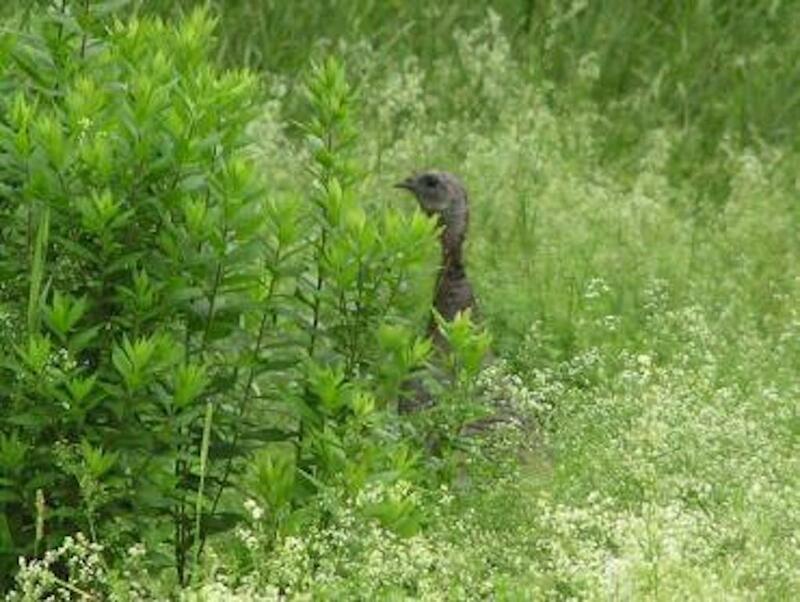 Wild turkey poults instinctively hide, low and silent in tall grass. They are very difficult to see. Knowing that there were hidden babies right around me, I had to be careful not to step without caution. 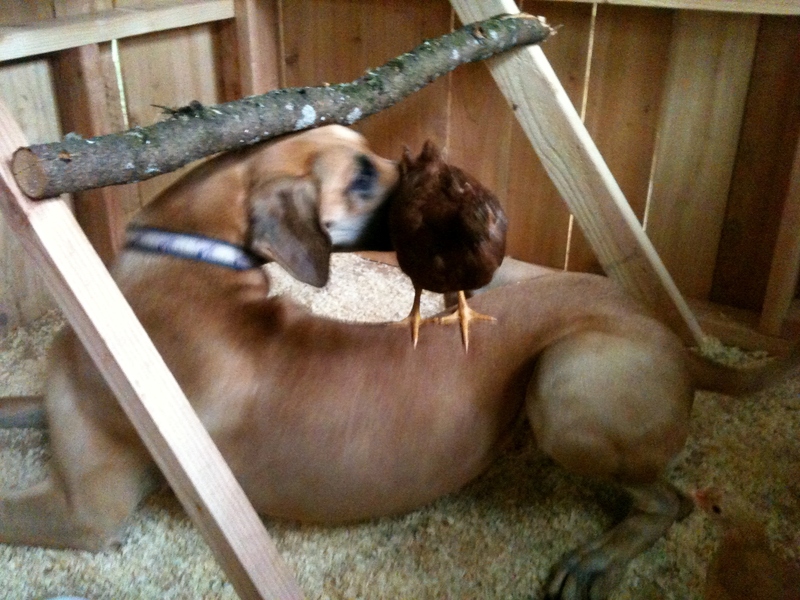 Making sure all is right with her little puppy-chicks. I was confident that these beauties were perfectly fine. They were very young, and were still sporting that fashionable egg-tooth. Still sporting a prominent egg tooth. They were playing “possum” hoping I wouldn’t see them. My shirt was doing double duty, acting as, well, a shirt…and also a catch for the poults. 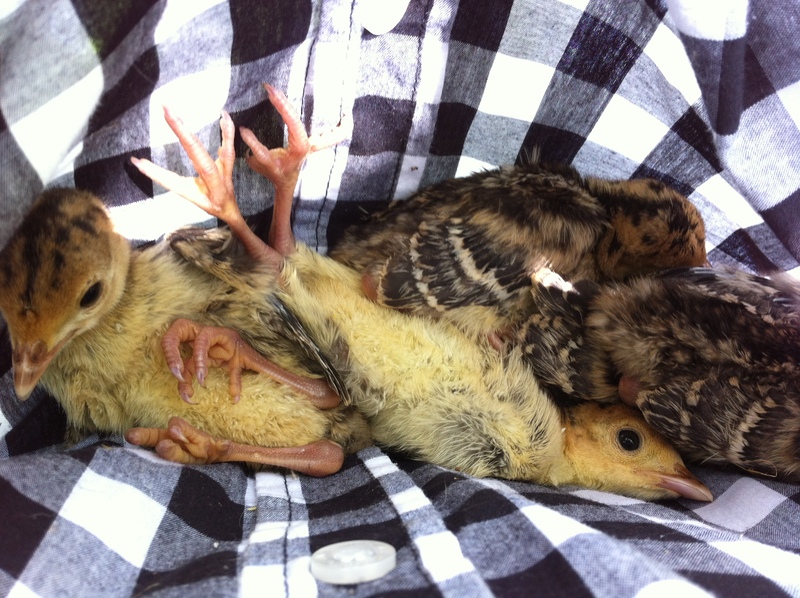 They lay quietly in their cocoon, huddled together looking at me with their big eyes…I was surprised at how much larger their eyes are than chicken chicks eyes. 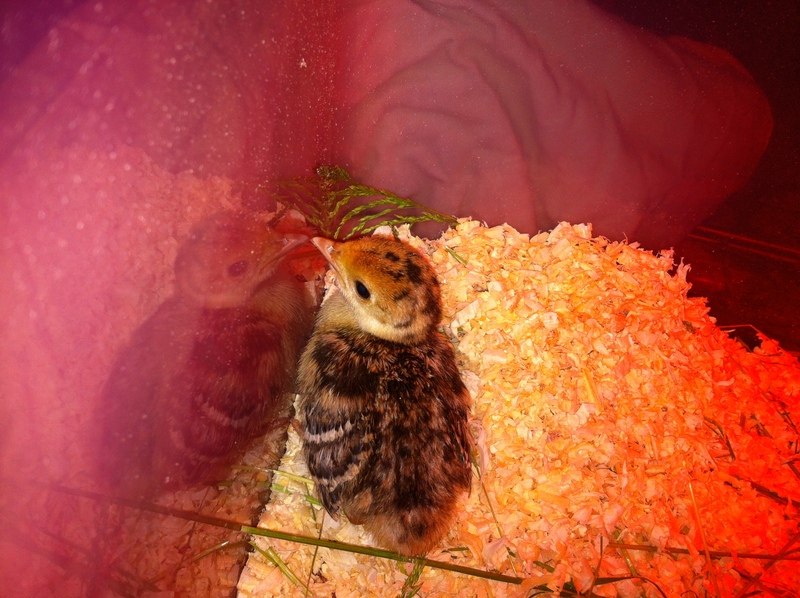 Wild Turkey poult #1. The first little one found by Penni. Kermit!!! 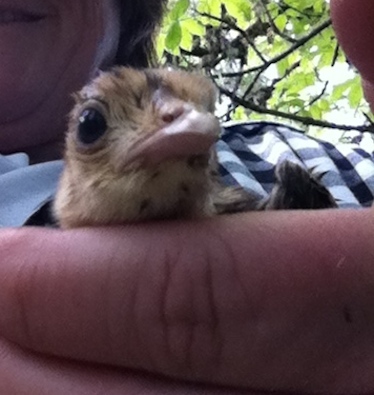 See how much small her eyes are compared to the wild turkey poult. (To be continued)….please come back tomorrow to read the rest of the story. 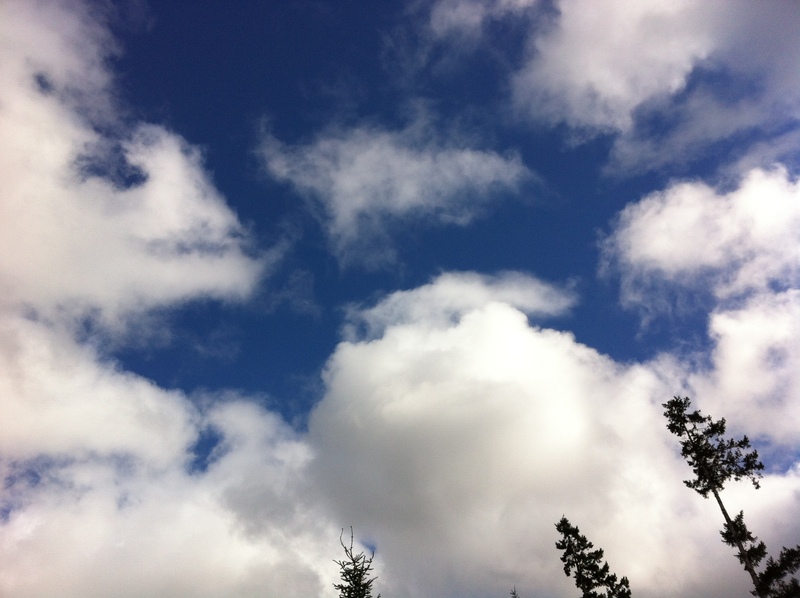 The scene…a beautiful, sunny yet windy, spring day. The grass is green and tall. The forest brings many surprises, not the least of which are the various, unexpected, wildlife encounters. Sometimes you’re just standing there… movement hits your sight sensors…you look in that direction…and you catch a glimpse of a hawk taking off with its prey, two foxes playing in the snow, the annual, brief, return of the elk, a coyote traversing across the landscape…or a wild turkey being flushed out of the brush by your dog. The latter of these events happened this week, and what has ensued has been another grand adventure. Picture this, a calm, partly sunny day. There is a steady wind culminating over the mountains behind us, funneling through the openness of the pastureland on this side of the creek. Suddenly, without warning, there is the sound of water, splashing water. Your mind quickly translates that sound to be the unmistakeable pattern of a dog…a very large dog moving at a fast pace through the shallows of a waning seasonal creek. You look in that direction just in time to see a very large winged bird taking flight. It is hard at first to process the awkward style of the beautiful brown coloring of the bird’s underside. It just doesn’t compute…it’s not a hawk, it’s not the Great Blue Heron, it’s not a duck. And then it dawns on you…this distinctive fly-only-if-I-have-to style is that of a wild turkey. 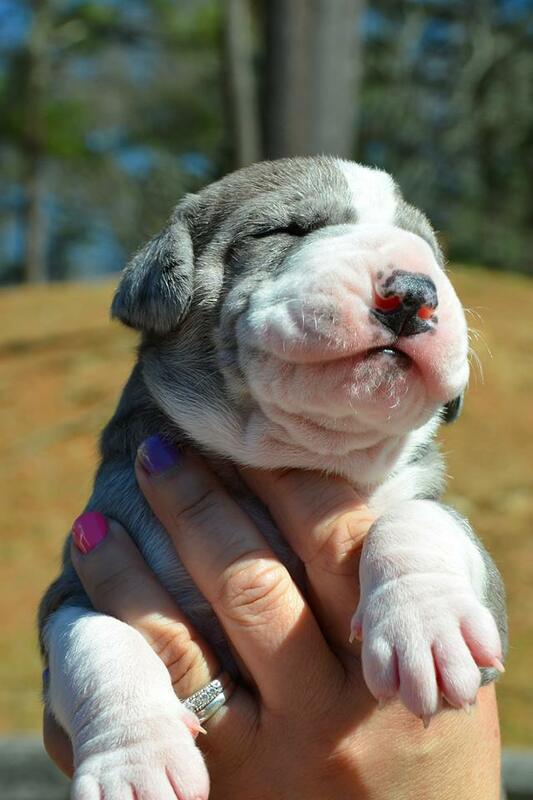 http://www.servicedogproject.org No…that’s Hugo…a future service dog!! …will not come back with a turkey in her mouth, I go about my chores. 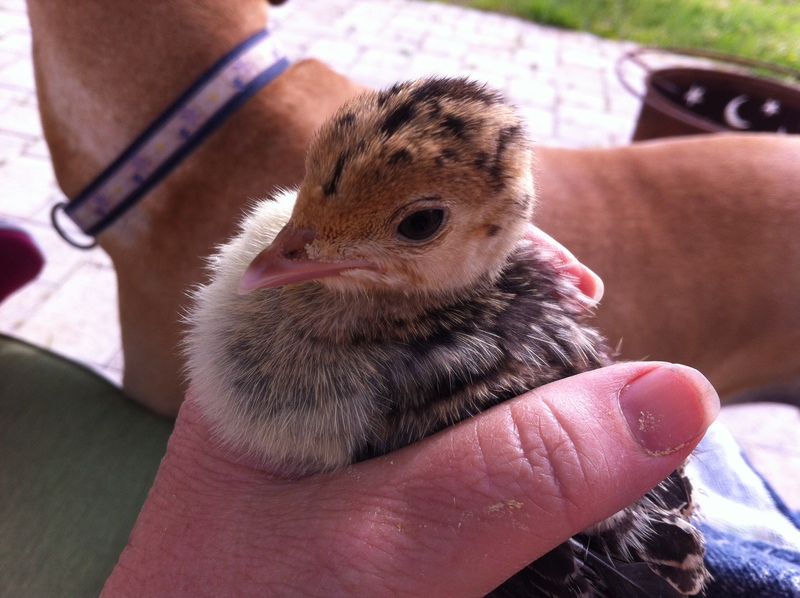 …..then she picks up whatever it is and runs with it…when I saw her pounce, my first thought was what did she find…immediately my second thought was…baby turkeys (poults! ) OH NOOOO! To Be Continued (please come back tomorrow to find out what happened next in this great saga on Haveadane Hill……….